So, I’ll admit it. Only two pictures in this post feature turkey. I’m pretty much just sharing some random pictures from my life lately. Here we go! This is what I do in night class. I’m almost positive all of my classmates thing I’m really weird. 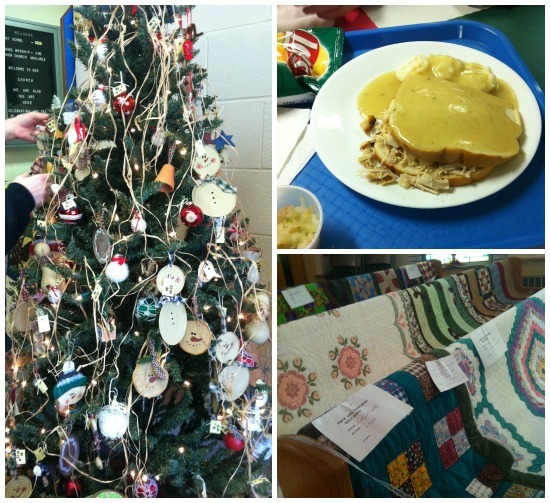 Hannah, my mom, and I went to a Christmas craft fair at a local church on Friday. We purchased some ornaments and turkey sandwiches! 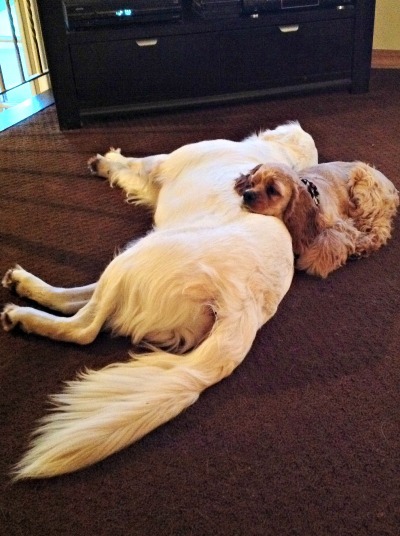 Brandy and Moses melt my heart. Lola melts my heart, too. Especially when she sits on benches with me. I bought a $5 milk frother off of Amazon and I love it. 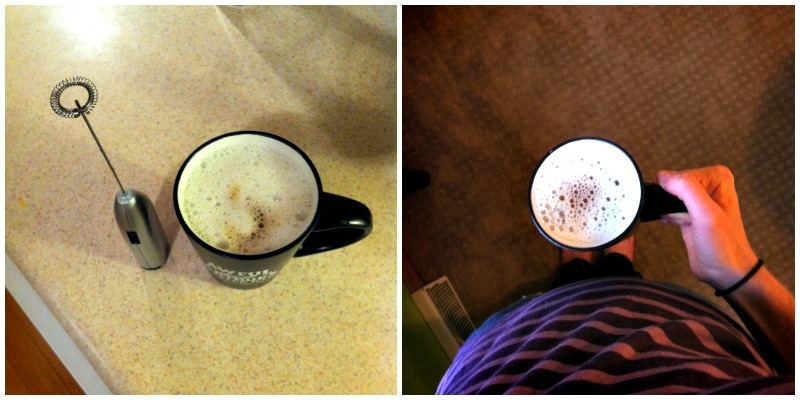 I may or may not have frothed a full glass of soy milk just for fun the day it came in the mail… I like froth, okay?! (After I typed that, I started thinking about how froth is such a weird word). So, I kind of lived up to my turkey themed post. I drew a turkey, posted a picture of a turkey sandwich, and now I’m off to run at my school’s annual turkey trot 5k race! After the race, I’ll probably do homework. On Sunday, I’m going shopping with my church for Shiloh! Good luck in your turkey trot today! Clay and I are off to run a local 5K too, leaving here in about 20-30 minutes for it. No Thanksgiving race though. Your turkey picture is super cute, if I had a night class I’d probably be drawing too~ your classmates are maybe just jealous they can’t draw a cute turkey like that. I want to hit some craft fairs before the holidays too… I need to check some of our local churches, Jewish community center, etc to see when they’re having em. 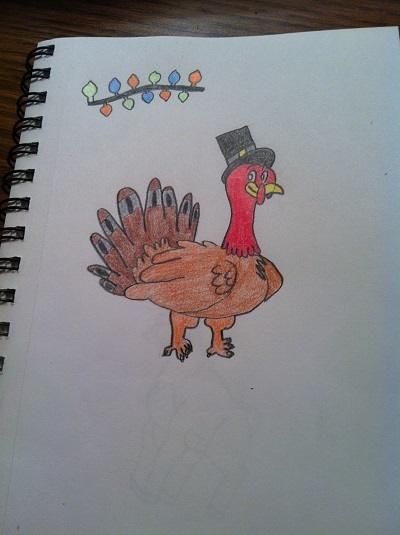 That turkey you drew is SO CUTE!! You’re really good at sketching! I have a milk frother too…love it! Makes such a difference in my hot drinks! Mmm. froth…. have a good time today! That frother sounds like a great foodie purchase! Froth is the best part after all! I love froth too!! And it is a very strange word. Great way to get in the mood! YAY! I haven’t been able to comment on your blog for FOREVER, it finally let me! That picture of brandy and Moses made my day. Too cute!!!! And of course so is lola! 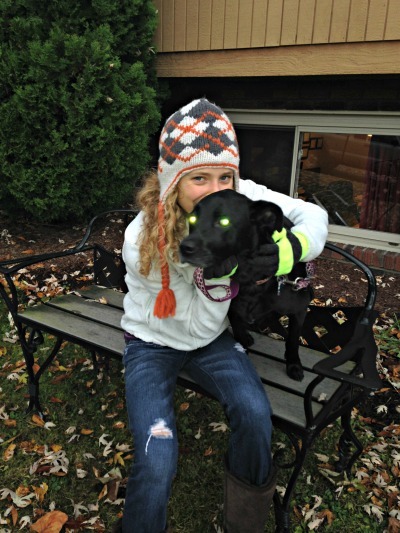 And is it just me or are Lola’s eyes glowing! ?